As the Arizona Department of Transportation prepares to rebuild two busy north Phoenix traffic interchanges in 2018, it is seeking input now from people who live, work and drive in the project area about ways to reduce construction-related impacts on the community. 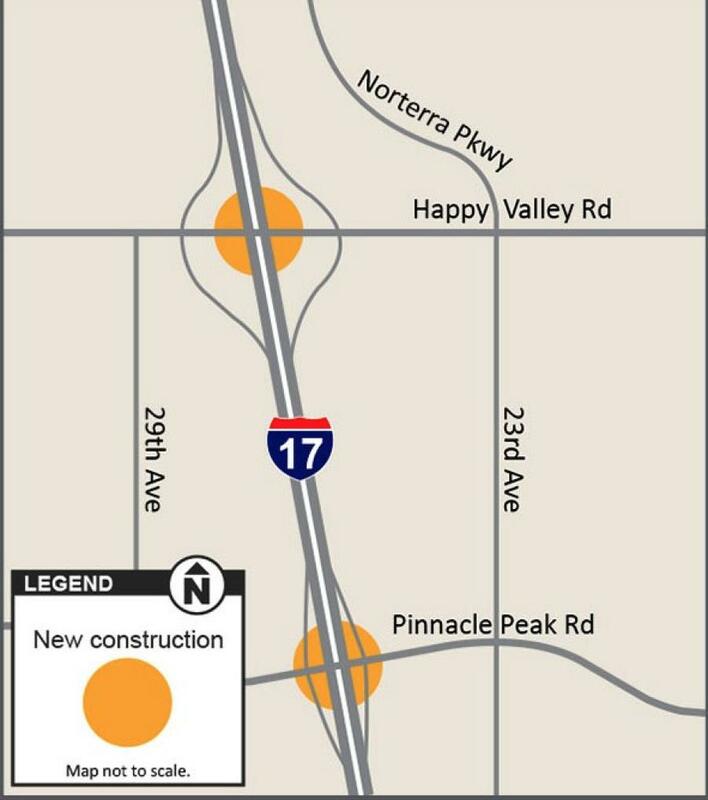 Construction at Interstate 17 and the interchanges at Pinnacle Peak and Happy Valley roads is still about a year away. However, the project team is currently working to develop construction schedules. Residents, businesses and others in the project area should fill out surveys by Oct. 30, 2017 to provide input for the project team's consideration before this phase of project planning is complete. Two online surveys are available at azdot.gov/I17TrafficInterchanges. One survey is for residents. The other is designed for businesses and other non-residential locations such as large employers; medical, dental and veterinary offices; religious centers; hotels; restaurants; retailers; and others. Both surveys ask questions about when and where people drive most often. The business-related survey further asks about the busiest times of day, busiest days of the week, shift changes and delivery schedules. Survey participants also can provide comments and suggestions for keeping traffic moving efficiently and safety while work is under way. Again, the deadline for submitting surveys is Oct. 30, 2017. While ADOT cannot guarantee an impact-free schedule, the agency is committed to finding ways to accommodate the community's needs and requests whenever and wherever it can. For questions or comments, call the ADOT Project Information Line at 855/712-8530 or email Projects@azdot.gov. For more information, visit azdot.gov/I17TrafficInterchanges.